Home Insights Is e-commerce at the brink of scaling up? E-commerce in Bangladesh dates back to as far as the late 90s, however, there was no real growth or potential in the market during the time. The industry began to grow after 2009 when Bangladesh Bank began allowing online payments. Payment aggregators like SSL Commerz became visible and early e-commerce websites like ajkerdeal, rokomari, and akhoni(now bagdoom) began sprouting. This, coupled with the introduction of WiMax Internet, became the catalyst for driving exponential growth in the industry. Soon foreign players like Kaymu and Daraz (merged and later acquired by Alibaba) entered the market dominating the industry with their vast experience in e-commerce and deep pockets. In 2013 Bangladesh Bank also lifted its international payment restriction and allowed for Bangladeshis to purchase goods and services from foreign websites using international credit cards, facilitating e-commerce business with the global market. The 3 types of e-commerce most prevalent in the country are: business-to-business (B2B), business-to-consumer (B2C), and consumer-to-consumer (C2C). It is estimated that there are 100 e-commerce companies in the country and 10,000 facebook-commerce (f-commerce) businesses present . In comparison to e-commerce, f-commerce has greater popularity due to its low barrier to entry, as it can be done from home, requiring only goods to sell, logistics and a facebook page. E-commerce businesses on the other hand require much more capital investments to launch as well as paperwork to formally register the business. Due to the ease of starting and greater popularity, f-commerce remains the most popular medium of doing e-commerce throughout the country. 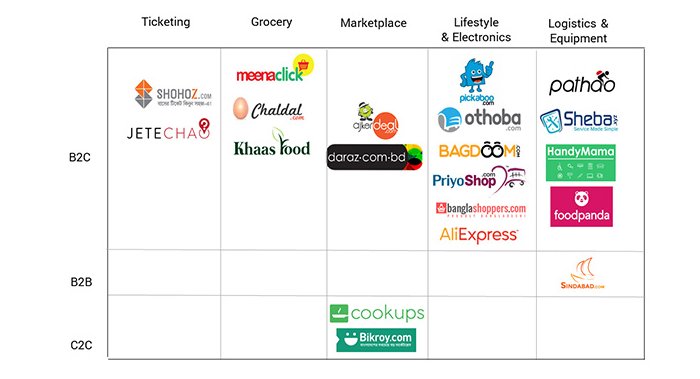 However, in Dhaka, e-commerce companies have a stronger relative to f-commerce businesses. Outside Facebook, the largest player in the market is Alibaba, which acquired the merged Daraz & Kaymu, not too long after acquiring a 20% stake in bKash , the country’s most popular mobile financial service. Another notable player in the e-commerce market is Chaldal, a y-combinator backed grocery startup founded in 2013, which has recently raised $5.5 million to develop nano-warehousing technology. Other notable local players in the market include those in the diagram below. Smartphones and the internet, these are the minimum basics required for consumers to take part in e-commerce and at the moment, there are over 90 million active internet connections  (more than half the population), with 84.7 million being mobile in the country . Despite launching 4G networks this year, advancements in the technology required to provide network coverage and make internet both accessible and affordable to the greater population outside major cities remains a problem. The main reasons behind this being high taxes and fees for telecom operations. Thus, policies and regulations of internet service providers who provide one of the basic requirements for e-commerce, the internet, remain stringent. Rising internet penetration: internet subscriptions have been growing at a rate of 19.4% annually since 2012, currently amounting to over 90 million as of September 2018. Smartphone penetration: In 2017, smartphone penetration was at 31% in the country and set to grow to 75% by 2025 , driven by declining prices making it more accessible to the greater population, notably in suburban and rural areas. Deteriorating traffic conditions: According to World Bank reports, over the last 10 years the average speed in traffic dropped from 21km/h to 7km/h, and if conditions remain the same, will drop to 4km/h . Adding the fact that almost 1/3rd of all registered vehicles are in the capital city, the conditions have been encouraging more and more people to shop from home. A young population: Currently 43% of the population is under the age of 25 , who have become acclimatized to technology and view functions like e-commerce as being second nature to living with technology. At the moment the main mode of transactions for e-commerce businesses remains being cash-on-delivery, though there is a growing trend towards non-cash payments via gateways such as bKash, Upay, Nexus Pay and other services. The e-commerce market is valued at $250 million  which has been growing at a rate of 8-10% annually , making it an industry worth noting, especially considering that market analysts estimate the market to grow to a $20 billion industry by 2020 . It is also estimated that 10 billion taka worth of transactions take place per year in the market . 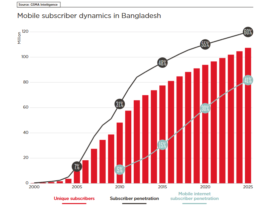 Since last year, Bangladesh ranked as the fifth largest mobile market in the Asia Pacific. With over 43% of the population under the age of 25 , who have been acclimatized to technology in an environment of growing GDP per capita, the macroeconomic environment for e-commerce looks bright for the country despite many challenges. According to the National Digital Commerce Policy, in effort to protect local investors and companies, foreign investors are not allowed to own more than 49% of any e-commerce ventures, however, this policy has been backtracked in less than 2 months from approval . The reason behind the initial change was to protect local e-commerce businesses and help the market grow, however, the policy was against the government’s policy of allowing foreign investors to have 100% stake in businesses . According to the policy, businesses will also be required to provide details of products offered online as well as return policies, and they will also be bound to make contracts with suppliers, logistics companies, and online payment services in effort to create a transparent supply chain. 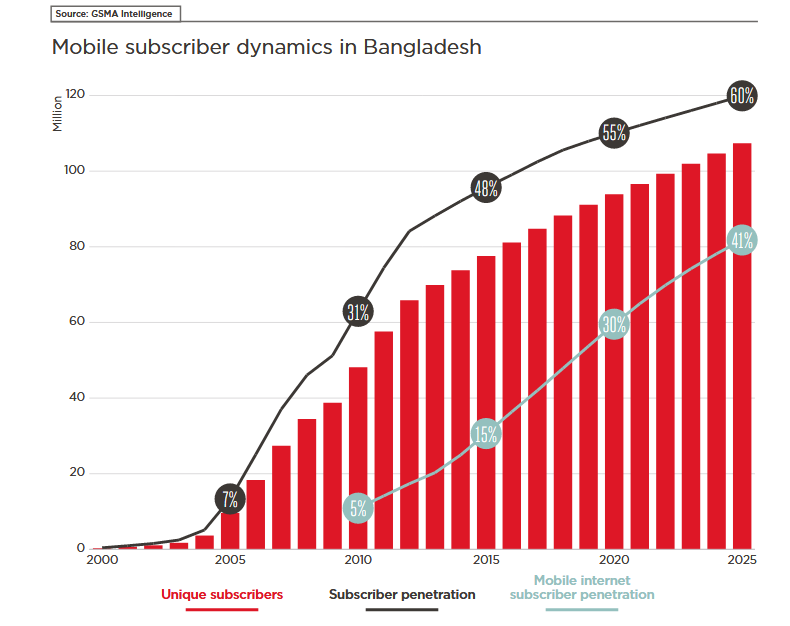 Despite 3G networks covering over 90% of the population , Bangladesh falls far behind its neighbors with an internet penetration level of 33% . This is especially true in rural and remote areas of the country. Other challenges include a lack of trust and logistics infrastructure required to deliver products to consumers. Trust remains one of the biggest challenges to overcome among existing e-commerce users, and a developed last mile logistics is integral to building trust between businesses and end users. Besides this, overall the country ranked 177 in the World Bank’s ranking of “Doing Business Report 2018”. Credibility & Trust Issues: There is an issue of trust from the customers’ end on companies not selling what is advertised online. Logistics Channels: Despite the emergence of e-delivery companies, companies face pressure on properly managing logistics channels and get the right product to customers on time throughout the country. Unstructured Supply Chain: There is no proper warehousing system or formal modern inventory management systems in place. Shift towards F-commerce: Inability of F-commerce businesses to deliver on their promises reflects on overall customers online shopping experiences. Funding: Most banks are not open to funding e-commerce businesses due to a lack of collateral, and most investors focus on short-term gains making it difficult for businesses to scale. However, recently Bangladesh Bank has drafted a law recognizing movable properties as collateral which may help local businesses finance their scaling operations. Human Resources: Lack of skills, technology adapted talent is scarce in the industry, making it difficult for businesses without deep pockets to continuously innovative naturally. Dhaka is the most densely populated city in the world, boasting 19,447 people per square mile and a total population of over 18 million , more than 11% of the country’s total population. The city has the strongest mobile/internet network in the country, has real estate more expensive than in Manhattan, and is in itself one of the biggest challenges of e-commerce businesses as it is also the center of the majority of their commercial activities. By 2021, Bangladesh aims to become a middle-income country with a population of over 170 million. It is expected that by 2020, the number of 3G network users will surpass 2G users. According to market analysts, the country’s e-commerce market is set to grow to a $20 billion dollar industry by 2020 . Post offices in the country are also due to deliver parcels for online marketplaces, adding an existing 8,500 offices  to the current infrastructure of the market. Much of the potential of the e-commerce market remains untapped, especially in rural/suburban areas, but with growing accessibility of smartphones and the internet, they may be the potential pool of customers e-commerce businesses need to scale their operations. This may also lead to an assisted e-commerce industry unfolding as word of mouth and referrals remain a significant influencer of what customers buy in these areas more than in the city. Currently many other major players in the global market are set to enter the market, including Walmart, Amazon, and Xiaomi in the coming years. Political volatility remains a concern in the country as hartals, strikes, and protests have the potential to paralyze the country’s logistics. If the e-commerce industry is to scale, and do so in the near future, it will need to address not only the issue of funding, but also reaching out to a larger customer base, outside Dhaka city. It will also need to streamline its processes to reduce time required for delivery, build trust with customers, and reduce costs of their operations. If the local players don’t up their game soon, they may soon find themselves in a highly competitive environment dominated by e-commerce giants like Alibaba, Amazon, and Walmart, which is what’s taking place in India’s e-commerce market.